Been diving in Segredo? Please Vote! Segredo is a cavern in the very south of Portugal at the tip of the European continent. The Atlantic here is often rough, the wind howls in the winter and the waves smash into the sea cliffs. The dive is slightly tricky. The skipper finds the spot and gives you a rough guess of where the cavern starts. To get in you need to first dive to around 20 meters and then find a small entrance in the rock wall. I did my master thesis here researching cup corals which are found in the caverns on this coastline. The entrance is spectacular. It is covered by cup corals of all colours. As part of my research was mapping the cup corals in the caverns, I have dived this site thoroughly. The main attraction here apart from the rock formations, are the different coloured cup-corals, sponges and other macro life and lobsters hiding out in their holes. One day it was stormy and the sea was rough; the wind was howling but we went to see if we could go dive that day. My friends and I had a limited time to complete our Master thesis and we needed to dive as often as the sea would allow us. The Captain did not look too sure about it that day, I even think he said he would not recommend it but said we had to decide. So we jumped on the boat and went for it. The waves were slamming into the rock face and water was spurting out the cavern entrance. I looked at Ana, my buddy on this dive, this was the first time we dove together but she seemed undeterred by the conditions. Our plan was simple. We jump in and go to the bottom and hope that the visibility is better and the ocean calmer down there. Inside the cavern, it was normally calm. If the conditions allowed us we would complete the full survey as planned including setting up quadrates, taking measurements of cup corals and other parameters. 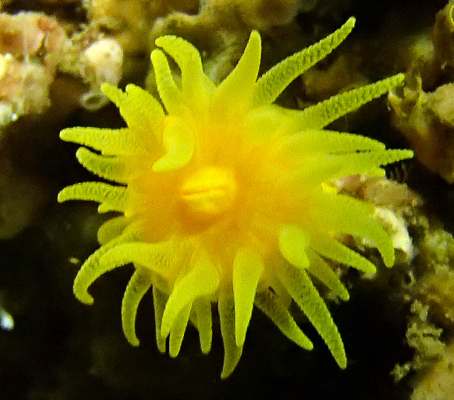 If the conditions were not good enough, we would just take some pictures of the corals and go. We took a deep breath and prepared ourselves for the cold ocean waiting for us and we did a backward roll off the dive boat. We descended, staying close together, barely being able to see the other. I kept hoping it would be better on the bottom. Then we hit the bottom. Hmm, I guess not. I signalled to Ana to set our compasses in the direction of the cavern entrance. The current was strong and we kicked hard to swim towards the cavern entrance. Once inside the visibility cleared up to 5 meters but the surge got worse. We were being pushed in and out of the cavern roughly and we tried to dodge the rocks in our path. To my amazement, Ana unclipped the quadrate from her back D-ring and wanted to start work. I signalled that we would go on to plan B. Just take some pictures and get out. I was still being pushed in and out of the cavern. I counted the knots on the line I had set up down the centre of the cavern. Fifteen meters in and fifteen meters out! I did another quick assessment of the conditions. The waves were forcefully hitting the rock wall and causing small rocks to fall from the ceiling. This is too dangerous I thought and I called the dive. Just as I gave Ana the thumbs up a big wave hit the cavern and caused all the sediment to whirl up and cause a blackout. I checked my compass and started swimming against the surge out with Ana following closely. We were still being pushed around and had to dodge the rocks that came up suddenly in our face as the visibility was very limited. I clutched onto the side of the cavern wall and started clawing my way out. Kicking hard and pulling on the rocks to prevent being washed back in the cavern. After what seemed like a long time of heavy breathing and powerful kicking we got out of the surge. We went up together in extreme excitement and burst out of the waves close to the boat in hysterical laughter. That was a close call. The captain looked confused but was happy to see us back alive. The Author: Kira is a PADI MSDT Open Water Scuba Instructor, Full Cave Diver (IANTD and TDI) and holds an Master of Science in Marine conservation and Biodiversity. 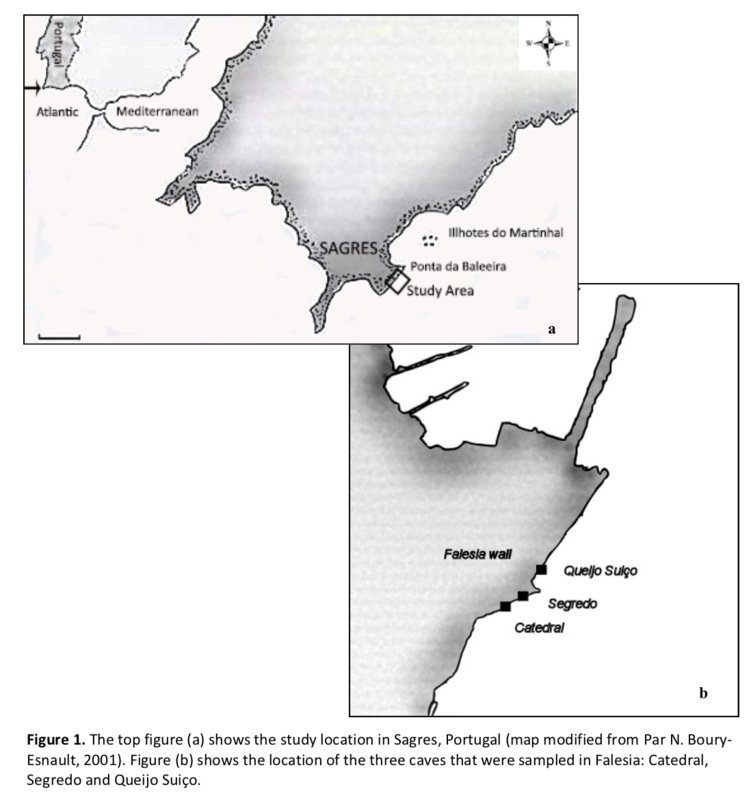 Map of Portugal, Segredo dive site.